Most homeowners believe the purpose of attic ventilation is to remove heat that builds up in the summer. That’s accurate, of course. but what that answer leaves out is just as important as what it includes. If you’ve ever walked into the stuffy confines of a room that’s been completely closed for a lengthy period, you know air tends to stay in place. You also know that just opening a door or window doesn’t solve the problem immediately. A flow of air must be established to produce the air exchange needed to remove all the stale air. That’s what an efficient ventilation system must do – provide a steady, high volume of air movement. During warmer months, ventilation helps keep attics cool. Radiant heat from the sun warms the roof and radiates into the attic. If not properly vented out, it can radiate into the living space affecting the comfot level inside the house and contributing to higher utility bills. The reduced temperature in your attic will help keep the ductwork and air inside your home cooler. The resulting effect will be a reduced strain on your air conditioning unit. During cooler months, ventilation reduces moisture to help keep attics dry. The shingles and decking of your roof system may deteriorate prematurely due to heat and excessive moisture buildup. 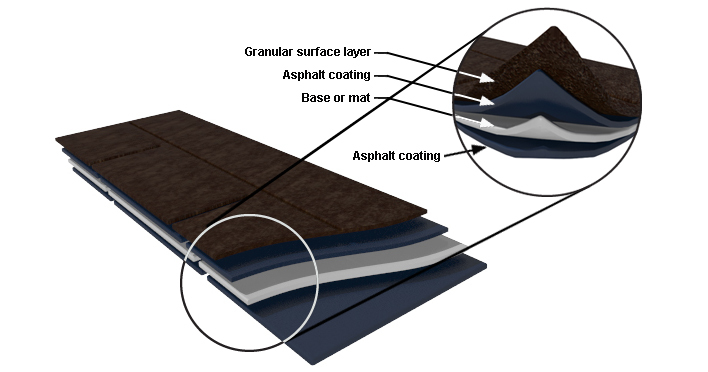 By reducing the surface temperature of the shingles and the existence of moisture on the underside of the decking by properly ventilating the attic space, a homeowner may be able to extend the life of both of these materials. Winter creates a special attic ventilation problem in areas where cold temperatures are common occurrences. The problem begins with the formation of ice dams which prevent melt water from running off a roof. Ice dams can form when warm air from the home accumulates in the attic, lower areas of the roof remain cold and a snow cover accumulates on the roof. The melted snow flows down the roof until it reaches a colder spot, such as the eaves, where it refreezes, forming a back up of ice commonly called an ice dam. 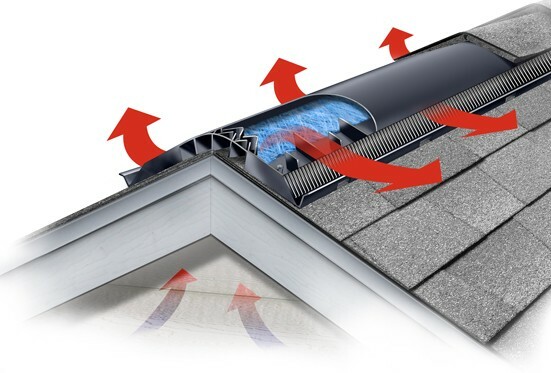 A properly designed ventilation system creates a “cold roof” – a condition where the roof temperature is equalized from top to bottom, which helps eliminate the conditions that lead to the formation of ice dams. Roof damage occurs when the water pooling against the dam begins to back-up under shingles. Plus, water can infiltrate into both exterior and interior walls, leading to rotted roof decks and rafters, ruined insulation, moisture inside the walls, mold and peeling paint, which could cost a homeowner hundreds of dollars or more to repair. Proper attic ventilation systems allow a continuous flow of outside air through the attic which creates cooler attics in the summer and drier attics in the winter. It consists of a balanced system between air intake (at your eaves or soffits) and air exhaust (at or near your roof ridge). At American Roofing and Renovation, we use CertainTeed Ridge Vents to provide our clients with excellent and reliable products as well as a best-in-class manufacturers warranty. 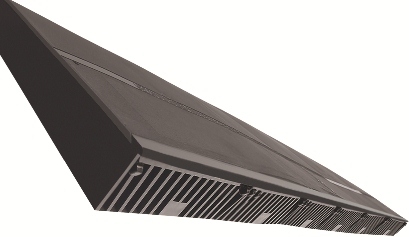 CertainTeed Ridge Vents are designed to provide exceptional weather protection and superior ventilation. Ventilation is enhanced by the use of an external baffle that deflects wind and weather over the vent and creates negative pressure to “pull” air from the attic, resulting in increased airflow. American Roofing & Renovation and CertainTeed offer you a one-stop shop for your complete roofing solution. 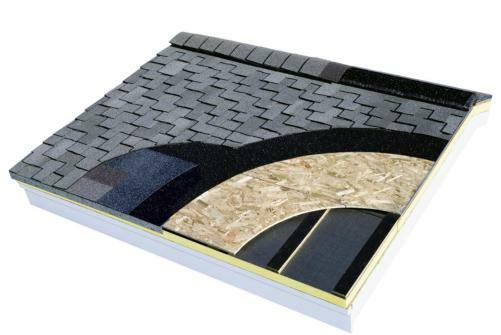 CertainTeed Ridge Vent, CertainTeed Rolled Ridge Vent and CertainTeed Intake Vent are all part of the CertainTeed Integrity Roof System – a quality roofing system featuring the proper underlayments, shingles, and accessory products along with proper ventilation.